UND bounced back from a tough loss against Omaha by taking down Western Illinois, behind strong games from Stewart and Avants. Now UND will finish their 3 game homestand against perennial power and pre-season favorite SDSU. SDSU was picked as the prohibited favorite in the Summit and some expectations could have had SDSU running the Summit League table and perhaps getting an at-large if things went wrong in Sioux Falls. Well both those ideas went out the window. However, they are still the team to beat when push comes to shove. They have been the gold standard in the Summit. There is one thing that still is eluding the Jackrabbits: a few NCAA victories. With one of the best players in the mid majors in his last year, the heir apparent, and a in-state player blossoming to create a solid 3 headed monster, it might be the best chance of doing so... provided they get in of course. This man needs no explanation, he has been the best player in the Summit League since his Sophomore Year. This guy can pretty much do it all and is once again averaging a double-double. He is coming off his best game in a while, where he went for 37 points and 8 rebounds. How UND decided to We will be interesting to see what he will be doing at the next level. How Tim Miles missed on him, we will never know. If you are looking for the post-Daum leader: here he is. He has built off his impressive freshman season with a superb sophomore season thus far. He is shooting it lights out from 3, 49.6% so far, and has provided a great secondary scoring punch thus far. 1) Pick your poison: How will UND defend SDSU? Will Jones go with the old: Let Daum score 40, stop everyone else or will he devise something to slow him down and hope everyone else does their jobs. 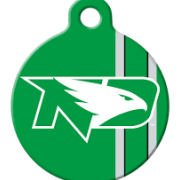 3) Come out swinging: UND needs to throw the first punch and needs to come out flying. This needs to be the best start they have had this season. Thanks again SW for all your efforts. Unfortunately, I agree with your prediction. MIght even be more like a 20 point spread. Either way, I will watch some and try to enjoy. Let's see where they stand. Hoping the football team shows up again. SDSU is one of the better college basketball teams in the country. They already have some impressive wins this year. They needed double at USD, which appears to also be a good team themselves. To Keep Avants out of foul trouble, I'm hoping we throw a combination of Rebraca, Walter, and maybe even Coudreau at Daum and make him earn all his points. Flatten and Jenkins are very good players too, so will take a good defensive effort on them as well. I wouldn't be surprised to see a fair amount of Igbanugo to help with that. I've been impressed with how different combinations of guys have given good minutes throughout this year. Stewart will need to play another solid game - make good decisions on scoring when it's there and setting guys up like he's been doing. Moody and/or Brown will need to get it going from outside to keep things open inside for Avants to do his thing and give Marlon some space to create. I agree with SW on it ending up at about a 15 point spread. But, maybe we can keep it lower scoring and be in it down the stretch. Does anyone know if you can watch this game with Roku? I can’t find foxcollege sports or midcosn when I search for channels. Download the espn app and pay 5$ for the monthly espn+ subscription. This game will be on espn+. On behalf of everyone, could Seales please stop shooting three's? Thanks. Agreed. Seales needs to realize SDSU is letting him have that shot because they don’t think his shot will beat them. Other than that he’s having a good game though. cant win by taking stupid shots by seales and Igbo. On a heckuva a run right now. Honestly I think they are doing pretty well. There aren’t many teams in the Summit that can neutralize Daum. The Taco Johns commercials on ESPN+ are driving me crazy! Too much skill by the Jacks. 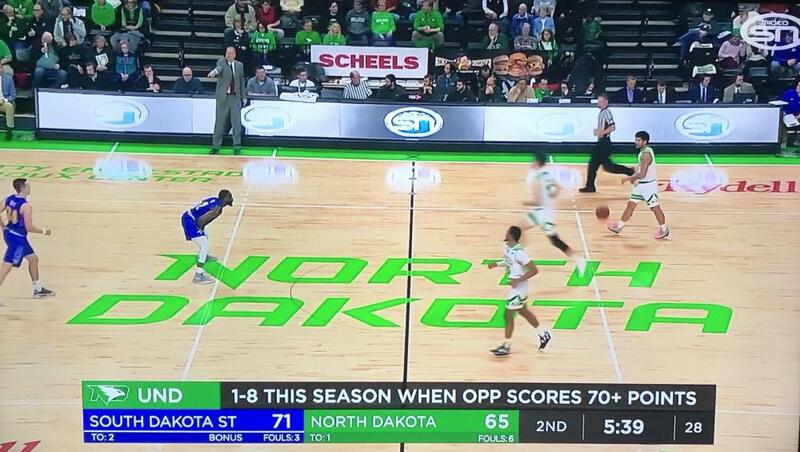 Wow SDSU also has a better homer on the Midco broadcast than UND does.That color guy is all SDSU, only time he got quiet was when UND made their run. Not sure what it looks like in person, but man does the new green paint on the Betty floor look bright on TV!! The fake 3-2-1 countdown seems to be working.